The new Nokia devices will not only be bloatware free but will also receive timely updates as and when these are released. 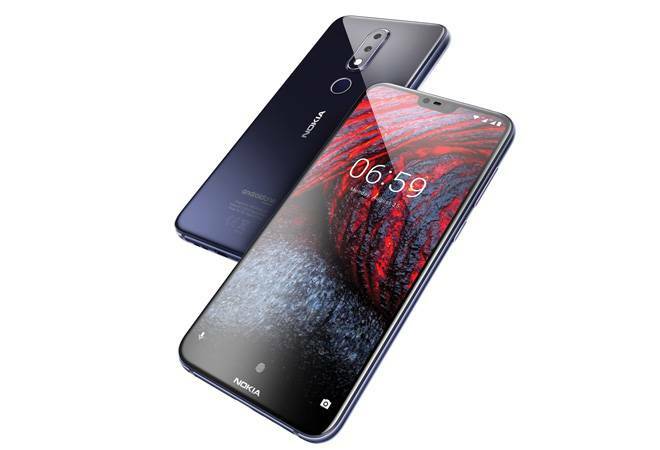 Flagship smartphones are getting bigger and taller, but here is a compact, mid-range device from HMD Global (the official licensee of Nokia smartphones) that looks and feels premium. The 5.8-inch full HD+ display, with a notch in the front and a glass rear, gives it a handfeel similar to that of iPhone X. But the side panels are not as smooth as the Apple product. In fact, the 6.1 Plus is a tad taller and thicker (147.2x70.98x7.99 mm) than the iPhone X, but 23g lighter (weighs 151g). It is the company's first 'notch' phone to arrive in India. The rear houses a vertical dual-camera unit and a circular fingerprint scanner. The power key and the volume button are mounted on the right panel, the 3.5 mm jack is at the top, the SIM tray is on the left and the Type C charging port, as well as the speaker, are at the bottom. The screen is protected by Corning Gorilla Glass 3 and offers great colour reproduction at full brightness. Complementing the looks is the stock Android OS. Instead of running on a customised user interface as most brands do, HMD Global has gone for the Android One Program. So, the new Nokia devices will not only be bloatware free but will also receive timely updates as and when these are released. The user interface is neat and simple. With a dedicated app tray in place, shortcuts can be saved to the home screen. Within the app tray, you will find the search bar on the top and next to it, a row of frequently used apps, thus keeping everything right at your fingertips. The phone managed to fetch e-mail messages, stream videos, handle multiplayer gaming, imaging and more with ease. Running Android 8.1.0, it is powered by Qualcomm Snapdragon 636 processor and comes with 4 GB of RAM and 64 GB of onboard storage. The next highlight is the dual-camera set-up at the rear - 16 MP and 5 MP units - capturing good bokeh images. The Live Bokeh option allowed me to adjust the background blur while taking a snapshot. I was also able to change the focal point and adjust background blur using the Bokeh editor in the Photos app. Bokeh selfies taken by the 16 MP front camera also came out well. Low-light photography was just average as the images had visible noise. Finally, the phone is powered by a 3,060 mAh battery, which lasted me a day with above-average usage. Overall, it is a great device but is likely to face competition from Mi A2 and Xiaomi Redmi Note 5 Pro in the same price range.